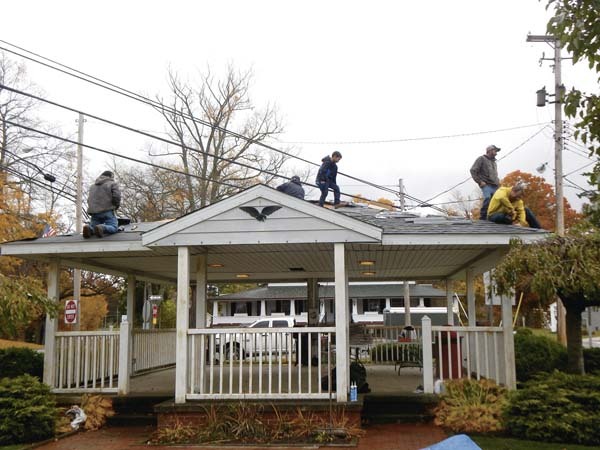 KINSMAN — Members of the Kinsman community joined together recently to replace the more than 40-year-old roof of the township center bandstand. Kinsman Trustee Greg Leonhard said the more than 20 volunteers of all ages tore the old roof off the building and then put on the new roof. The township was able to secure a $1,000 Serve Ohio grant through AmeriCorps for the Make A Difference Day project. While many communities held Make A Difference Day projects in October, the Kinsman group had to move theirs to this past weekend because of the weather. 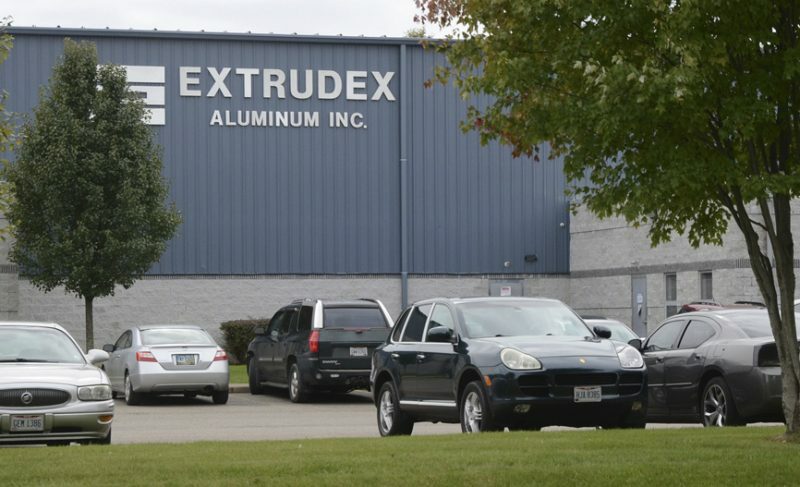 Leonhard said he heard about the Serve Ohio grant from the office of U.S. Rep. David Joyce, R-Bainbridge. Fiscal Officer Marge Crupi said the grant is affiliated with AmeriCorps, which promotes volunteerism in communities. “We had a great representation from many organizations and groups who gave of their time and talent to help,” she said. Among those helping were local Boy Scout and Girl Scout groups, American Legion Post, Kinsman Rotary, township officials, the Badger High School Beta Club and the Northeast Services Food and Clothing Exchange. Leonhard said people gave donations and manpower. The grant covered all material costs. Bob Nemeth of the Kinsman Rotary organized volunteers based on where their skills were best suited. Crupi said the bandstand is used year round for various events, including Flag Day, Memorial Day, annual township wide garage sale day and Santa Claus visit with children. “It is a very well used building,” she said. Leonhard said the roof needed replaced with new shingles and other work. “If it wasn’t for the grant, we would have had to wait another year to do this,” he said. He estimates the project cost $4,000, but with the grant and another $600 and free volunteer work, there was no cost to the township. Girl Scout Troop 80142 prepared meals for the workers at the NESFACE food pantry, which has been in the community for more than 35 years. Leonhard said another project volunteers are helping with is the park building roof north of the center. “The same volunteers are also helping us with that building, which did not cost the township anything,” he said. The park building is being restored at the former Joseph Badger Local School District property. “Between the two buildings, we saved $10,000 thanks to the help, donations and grant,” Leonhard said. He said the community is very generous and raised $3,600 recently at a fundraiser for next month’s Shop with a Cop. “We have a very generous community. When we have things like this that need done, everyone steps up and chips in. So many organizations come together and help out,” he said.